Perfect light on this beautiful Spring afternoon at Southern Oaks provided the perfect setting for this couple's first look before the ceremony. 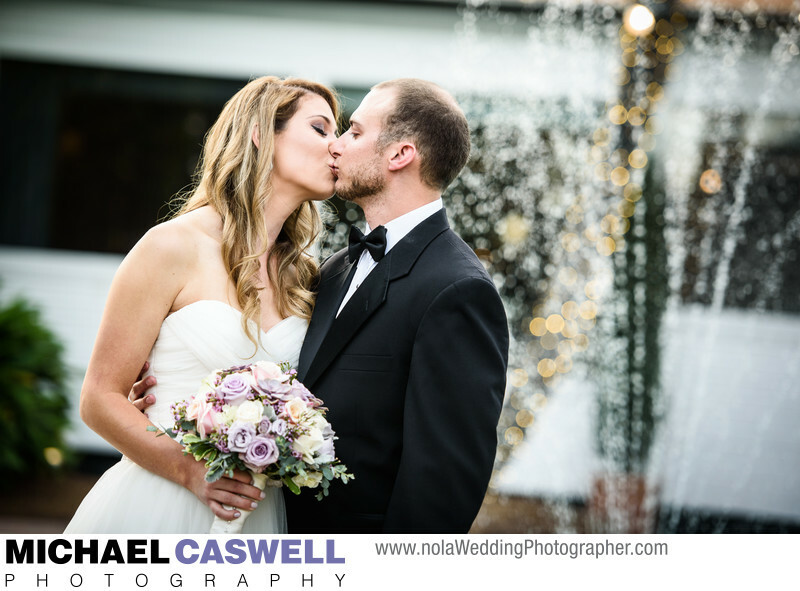 This is the pool area behind the plantation, with the spray of the fountain behind the bride and groom looking spectacular with the telephoto lens used for this series of photographs. This particular bride was a great example of one of the several positive aspects of having a first look, as she was very nervous and anxious to see her groom. She simply did not want to wait until the ceremony, and had to see him before! Her biggest concern was that she would cry as she walked down the aisle, adversely affecting her makeup for the remainder of the ceremony. If she had not done the first look, the stress she was feeling would have likely detracted from the emotional joy of the ceremony, and she felt much better once the first glance had taken place. Of course, this may not necessarily be the case with you and your fiancé! For some couples, it is more important to them to see each other for the first time as the wedding ceremony is beginning. Location: 7816 Hayne Blvd, New Orleans, LA 70126.